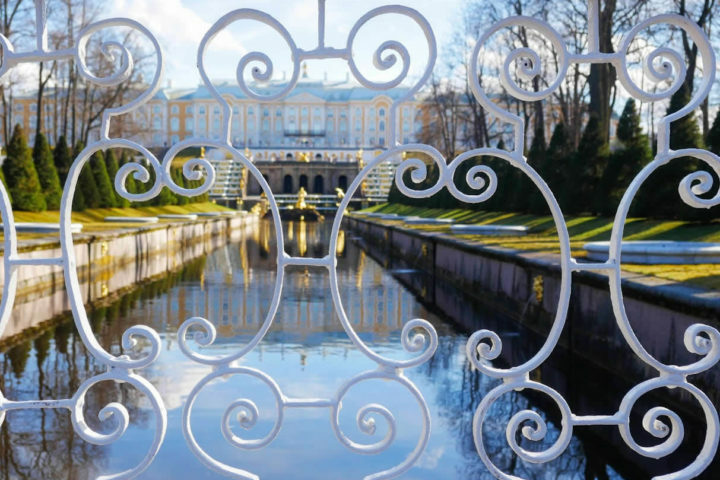 There are so many beautiful palaces in and around Saint Petersburg. But Peterhof is definitely one of the most beautiful palaces in Russia. 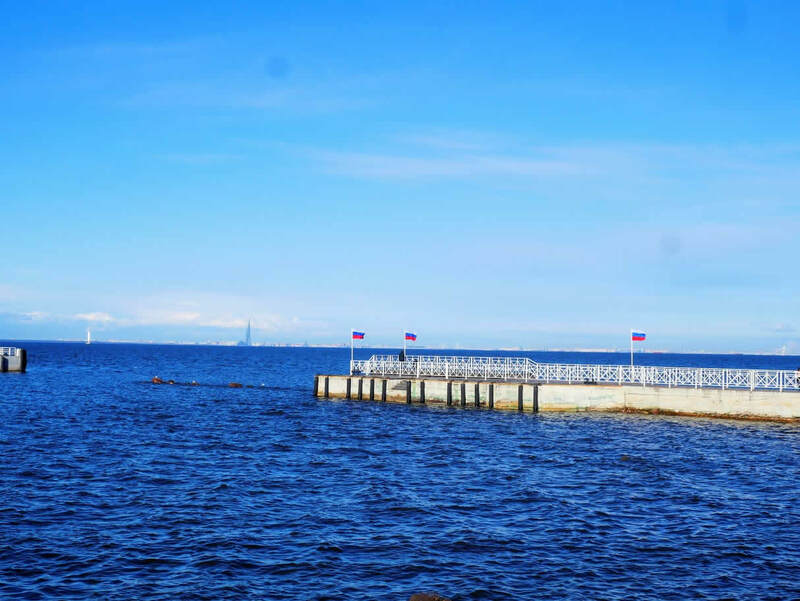 Being easily accessible, it’s a great place for a day trip from Saint Petersburg. 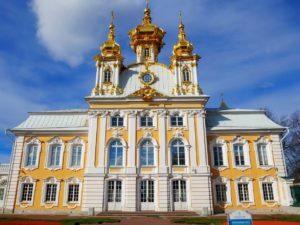 Here is everything you need to know about visiting Peterhof Palace from Saint Petersburg. Peterhof palace was probably one of the first places that symbolized travel to some far away countries to me. My mum visited it when she was 18 and I remember looking to those old black and white photos from her trip. Beside a bunch of kids dressed like hippies, I was amazed with that beautiful elegant palace in the background. 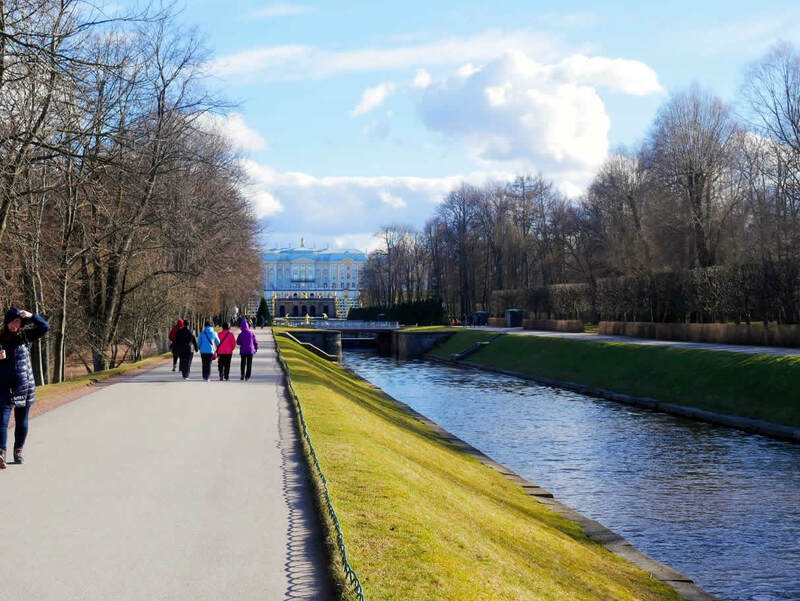 Fast forward and 44 years later I was finally in Saint Petersburg and while planning my trip there, visiting Peterhof palace was definitely a thing I wanted to do. 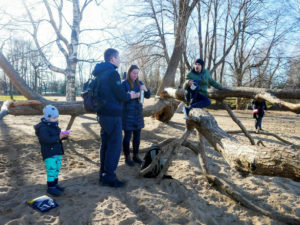 # – With a car: Since we were staying with our friends during our trip to Saint Petersburg, we went together to Peterhof palace with their car. It took us around two hours to get there because of a huge traffic jam on a highway. So, although travelling with a car always sounds convenient, I would try to avoid it in this case. # – With a boat: There are high speed boats that are connecting Saint Petersburg and Peterhof palace. Journey is taking half an hour only, so if you’re going to visit Peterhof palace on your own, I would definitely go with one of those boats. 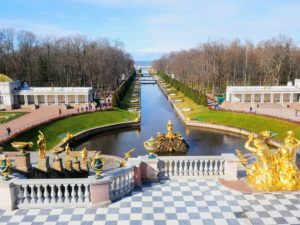 *TIP: If you would like to travel to Peterhof and have a tour of the palace, then this tour could be just what you’re looking for. 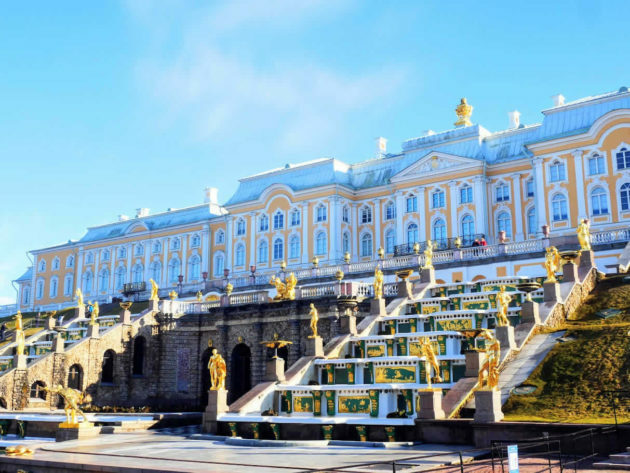 # – With an organised tour: However, if you would like to get both transport and a tour of Peterhof palace, then I would choose from one of organised tours. There are so many options to choose from: from private tours with a transport, a group half day tour or a private tour of the palace. You can choose the one which suits you best. Peterhof palace was built by famous Peter the Great. It was his summer palace and he’s filled it in with paintings he brought from his European voyages. Although much smaller originally, both the palace and gardens were enlarged a bit by every new ruler. 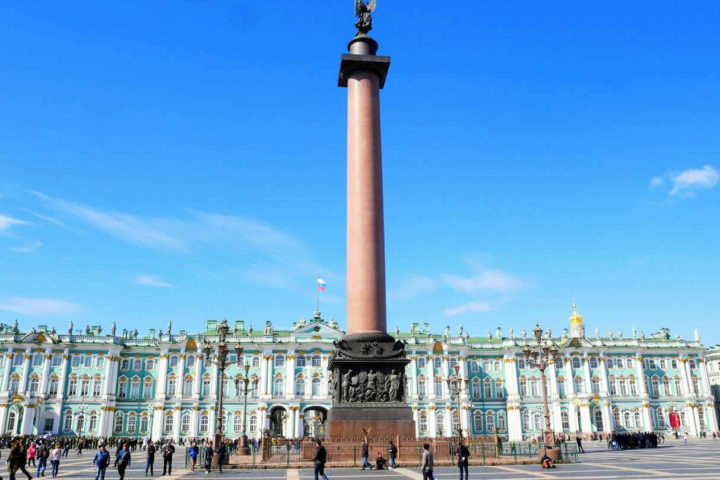 Peter the Great was inspired by some French palaces built by king Louis XIV. That’s why Peterhof is often called ‘Russian Versailles’ and is today UNESCO World Heritage site. 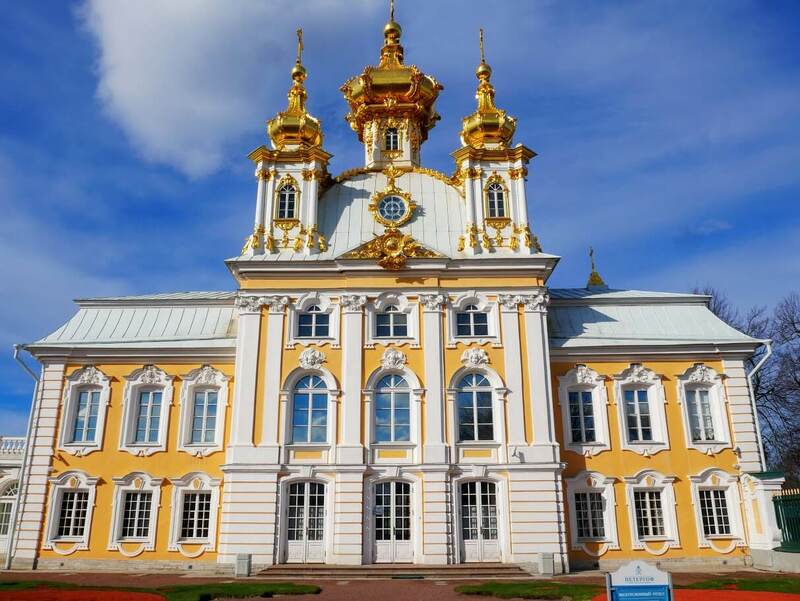 The central part of Peterhof is its impressive Grand palace. Although impressive from the outside, it’s actually quite small from the inside. We came there a bit late, so the palace was already closed. But, by what I read about it, it’s definitely worth taking a look inside, as well. TIP: To save yourself a time of queueing in a line and waiting to buy the tickets, you can buy them on line on a link here. When you’ll approach the palace, you’ll first see the ‘Upper gardens’ with its geometrical paths between the trees and white marble statues. 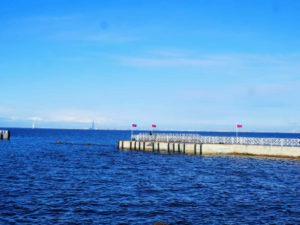 However, ‘Lower gardens’ are located between the palace and the sea shore. And that’s where majority of the fountains are. You can spend a few hours only by walking through these beautiful labyrinths made of trees. If you won’t have a lot of time, I would go straight to the ‘Lower gardens’, take a look on fountains and would take a walk towards the sea shore. TIP: There is a different entrance ticket if you would like to visit the ‘Lower garden’ only (it’s cheaper then the one which includes the palace, as well). You can buy it on line on a link here. Fountains are probably the most famous part of Peterhof. There are 64 fountains in front of the northern façade of the palace. The biggest one is the Samson fountain that was placed there to celebrate victory over Sweden in the Great Northern War. The original statue was stolen by the Nazis during the Second World War. Its replica was placed at the original place in 1947. I was in Peterhof in late April and the fountains weren’t opened yet. However, if you would like to see them be sure to plan your visit during the summer months. # – Stroll around its gardens – I just loved Peterhof’s gardens. They were so tranquil and peaceful, I could spent the whole day there. There are many benches in them, so you can sit every now and then, and enjoy in a beautiful garden. There are many smaller buildings in gardens, too. And that way you can see a complete Peterhof’s complex. 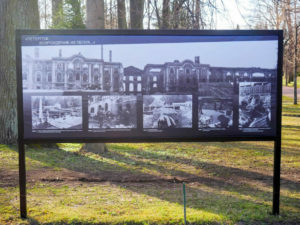 *TIP: Before visiting it, I didn’t know how badly Peterhof was damaged during the Second World War. 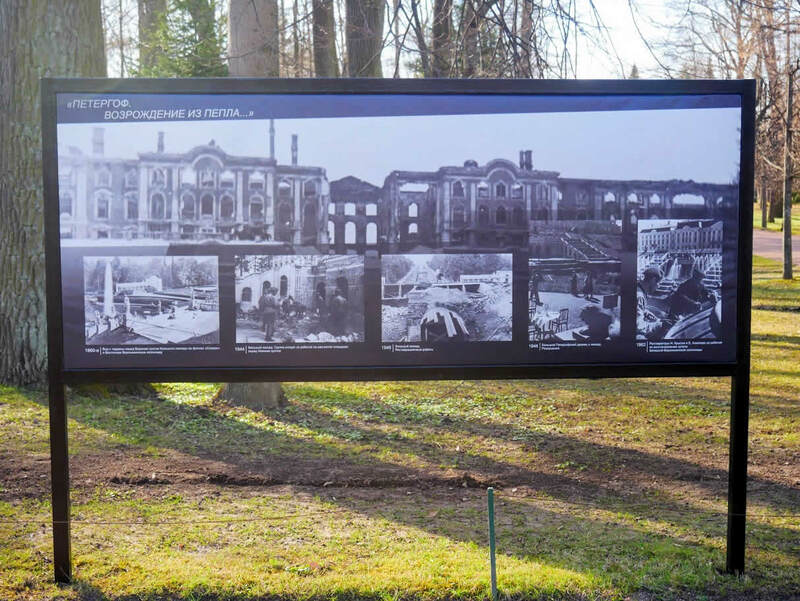 However, you’ll see some posters in a garden with photos from that time. It’s quite horrifying to see how it looked like after the war. # – Have a picnic – A benefit of travelling with locals is the fact that not only they know all the best places. But, it’s also in a fact that they know all the best picnic spots. We’ve taken some black tea and a traditional Russian pastry rom baba with us and had a wonderful time together. 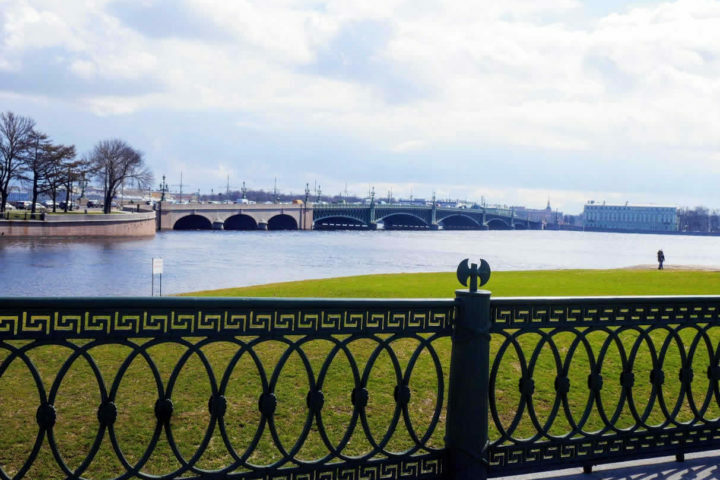 While eating and chatting about Russia and its history, my friend Sergey have told me that because of the estuary of Neva River that’s very close by, the sea around Saint Petersburg and Peterhof palace is not salty. Well, I tried it and I can confirm it (so yes, a little thing you can impress your travel buddies with 😉 ). *TIP: If you’ll walk all the way to sea shore (some 200 metres from the Grand palace) you’ll have a great view to Saint Petersburg. 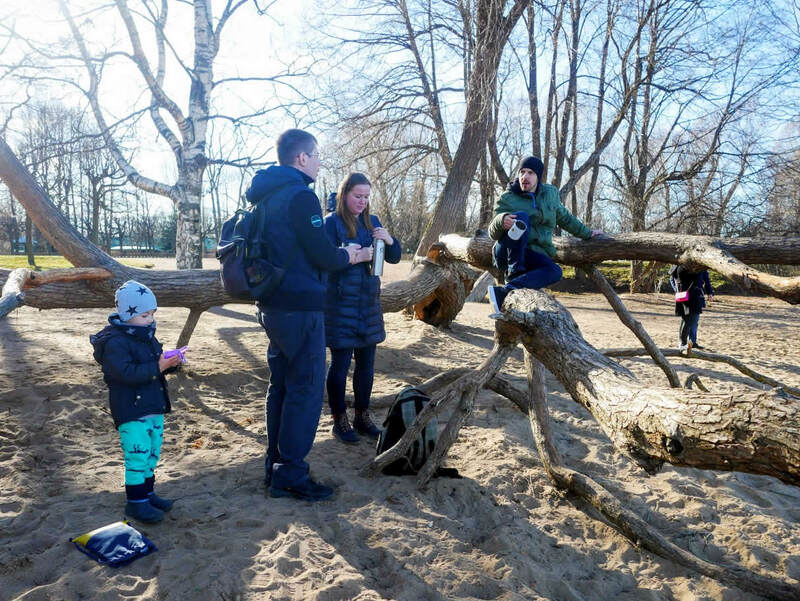 Standing right there at the edge of the Baltic Sea will give you an idea why Peter the Great chose that place to built his new city. 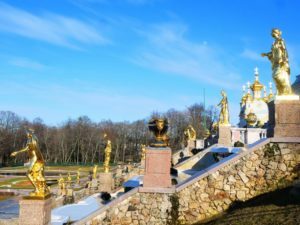 So, if you’re looking for a day trip from Saint Petersburg, then visiting Peterhof palace is something I would definitely recommend you to do. 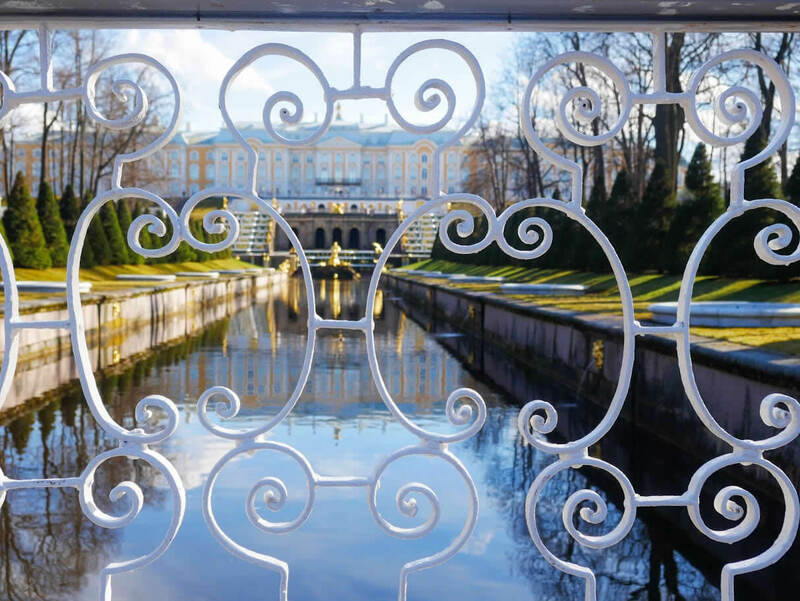 With its beautiful architecture, gardens and fountains and being easily reachable from Saint Petersburg, Peterhof palace is one of those things that shouldn’t be missed.